Scene from “Betrayal” at the North Coast Repertory Theatre. There’s text… and there’s subtext. 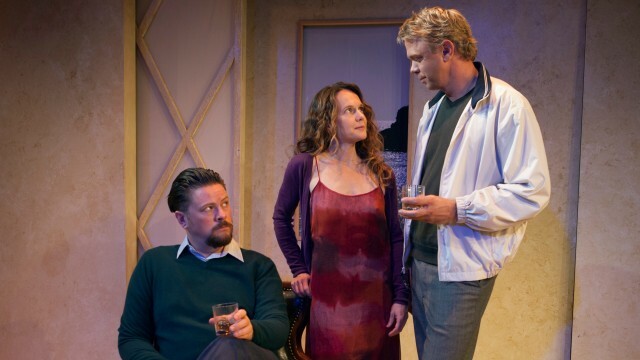 Harold Pinter’s “Betrayal” is all subtext. On the surface, the conversations seem terse, minimalist, a series of trivial near-non sequiturs. But the real drama is roiling underneath: layers of deception and multiple levels of disloyalty. Beneath those quotidian lines, within those famous Pinterian pauses, are all the real feelings, the genuine emotions: the rage, the disillusionment, the fear of loss or change, the self-doubt, the sour hopelessness. This 1978 play, inspired by Pinter’s own life — specifically, his two long-term affairs (the one with his future wife, Antonia Fraser, ongoing while he was writing this), while he was married to two different women. But infidelity is only the tip of the iceberg. Pinter spirals back in time, from 1977 — two years after the clandestine relationship between Emma and Jerry ended — to 1967, when it all began. Robert, Emma’s husband, shows up periodically and strategically. One of the play’s lingering questions is what he knew and when he knew it. In this entangled game of emotionally violent cat-and-mouse, it’s hard to keep score, or determine at any given moment, who’s manipulating or deceiving whom. All the sharp points of this “romantic” triangle are consummate dissemblers. They lie when they love, and when they don’t. They hide, they subvert, they avoid, they delude (perhaps themselves most of all). All we know for a fact is that one affair took place (several others are intimated). Everything else, everything that surrounds that one event – in time, place and sentiment – is up for grabs. North Coast Repertory Theatre guest director Frank Corrado (a Seattle-based actor/director who’s appeared in several NCRT productions) has had experience with a broad swath of Pinter’s canon. He knows his way around the Nobel Prize-winner, and mines the sly humor as well as the hesitations. Of the three capable cast members — Richard Baird, Jeffrey Fracé and Carla Harting (with a fast, funny cameo by Benjamin Cole as an officious Italian waiter), Baird makes the most of the pauses. But in his portrayal, there’s often a sneer on Robert’s cynical face (after all, he admits to being a book publisher who hates books). Baird is such a formidable stage presence, the other actors pale by comparison. But don’t underestimate their characters’ callousness. It’s hard not to be riveted by this complex puzzle of modern relationships. Robert and Jerry are frequent business collaborators and long-time best friends; Jerry was best man at Robert and Emma’s wedding. But though his wife and bestie betray him, Robert is no innocuous victim. He’s every bit as treacherous as the other two. Fracé’s Jerry may be the most lily-livered of the three, but his weakness is often contemptible. Emma, perhaps the most perfidious of all (was she already into her next affair while she was still with Jerry? ), plays the men off against each other. Competition and one-upmanship are paramount here. Robert can’t wait to wallop Jerry on the squash court (ironically, he admits to being “a brutally honest squash player”) . And he admits to thwacking his wife a time or two as well (he says it was the call of “the old itch”). Is any of them a sympathetic character? This is Pinterland, so the question barely applies. You just have to sit back and let it all unspool before you. Then you can replay the scenes in your mind, to try to disentangle all the clues and foreshadowings. Or you could always see the play again. The design work mirrors the dramatic structure of the piece: the set (Marty Burnett), with its sliding doors (they might as well be revolving doors), rotates the characters on a turntable. So each of the nine scenes sort of bleeds into the next, just as memory is a circular, shifty, overlapping thing. Pinter (who died in 2008) might’ve gotten a chuckle out of that. But it probably would’ve been silent. Performances are Wednesday at 7 p.m., Thursday-Saturday at 8 p.m., Sunday at 7 p.m., Saturday and Sunday at 2 p.m.
Running time: 1 hr. 20 min.